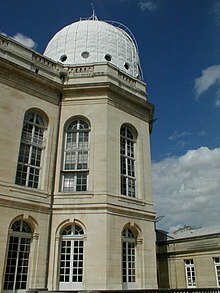 The Paris Observatory (French: Observatoire de Paris or Observatoire de Paris-Meudon), a research institution of PSL Research University, is the foremost astronomical observatory of France, and one of the largest astronomical centres in the world. Its historic building is to be found on the Left Bank of the Seine in central Paris, but most of the staff work on a satellite campus in Meudon, a suburb southwest of Paris. diffusion of knowledge to the public. It maintains a solar observatory at Meudon (48°48′18.32″N 2°13′51.61″E﻿ / ﻿48.8050889°N 2.2310028°E﻿ / 48.8050889; 2.2310028) and a radio astronomy observatory at Nançay. It was also the home to the International Time Bureau until its dissolution in 1987. The Paris Observatory Library, which was founded in 1785, provides the researchers with documentation and preserves the ancient books, archives, and heritage collections of the institution. Many collections are available on the Paris Observatory digital library. The observatory in the beginning of the eighteenth century with the wooden "Marly Tower" on the right, moved to the grounds by Giovanni Cassini, for the mounting of long-tubed telescopes and even longer tubeless aerial telescopes. Its foundation lies in the ambitions of Jean-Baptiste Colbert to extend France's maritime power and international trade in the 17th century. Louis XIV promoted its construction, which was started in 1667 and completed in 1671. It thus predates by a few years the Royal Greenwich Observatory in England, which was founded in 1675. The architect of the Paris Observatory was Claude Perrault whose brother, Charles, was secretary to Colbert and superintendent of public works. Optical instruments were supplied by Giuseppe Campani. The buildings were extended in 1730, 1810, 1834, 1850, and 1951. The last extension incorporates the spectacular Meridian Room designed by Jean Prouvé. The world's first national almanac, the Connaissance des temps, was published by the observatory in 1679, using eclipses in Jupiter's satellites to aid sea-farers in establishing longitude. In 1863, the observatory published the first modern weather maps. In 1882, a 33 cm (13 in) astrographic lens was constructed, an instrument that catalysed what proved to be the over-ambitious international Carte du Ciel project. In November 1913, the Paris Observatory, using the Eiffel Tower as an antenna, exchanged sustained wireless (radio) signals with the United States Naval Observatory to determine the exact difference of longitude between the two institutions. The Meudon great refractor (Meudon 83-cm) was a 83 cm (33 in) aperture refractor, which with September 20, 1909 observations by E. M. Antoniadi helped disprove the Mars canals theory. It was a double telescope completed in 1891, with secondary having 62 cm (24 in) aperture lens for photography. It was one of the largest active telescopes in Europe. The title of Director of the Observatory was officially given for the first time to César-François Cassini de Thury by a Royal brevet dated November 12, 1771. However, the important role played by his grandfather and father in this institution during its first century actually gives them somewhat the role of director. Also known as the Observatoire du Pic de Château Renard, the Observatoire de Saint-Véran was built in 1974 on top of the Pic de Château Renard (2,900 m or 9,500 ft), on the commune of Saint-Véran in the Haut Queyras (Hautes Alpes département). A coronograph was in operation there for ten years; the dome was moved there from the Perrault building of the Observatoire de Paris. Nowadays, the AstroQueyras amateur astronomy association operates the facility, using a 60 cm (24 in) telescope on loan from the Observatoire de Haute Provence. Numerous asteroids have been discovered there. ^ a b "The Paris Observatory". l'Observatoire de Paris. Archived from the original on 2007-08-24. Retrieved 2007-08-27. ^ Archives nationales, O1 117, fol. 991-993. See also Charles Wolf, Histoire de l'Observatoire de Paris de sa fondation à 1793, Paris : Gauthier-Villars, 1902, p. 194 and following. ^ "Completion and delivery of equipment bay and camera to CNES mark major project milestone" (Press release). Released jointly by Observatoire de Paris, CNES and CNRS-INSU. 2005-06-30. Retrieved 2008-08-03. ^ "L'Observatoire du Pic de Château Renard (2900 m)". Histoire (in French). l'Observatoire de Paris. Archived from the original on 2007-09-15. Retrieved 2007-08-27. Guinot, B. (2000). "History of the Bureau International de l'Heure". Polar Motion: Historical and Scientific problems. pp. 175–184. Bibcode:2000ASPC..208..175G. 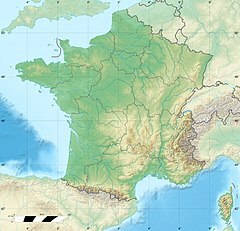 Wikimedia Commons has media related to Observatoire de Paris.